1. start your dough by combing the yeast and warm water in a mixer and let sit for 5-10 minutes until bloomed. 2. add sugar, salt, shortening, egg + yolk, extract, spices and flour. knead on low with your bread hook until a dough forms. dough should come off the sides of the bowl (but not the bottom) when it's ready to rest. if need be, add flour by the teaspoon to get a more tacky dough. dough will be sticky however overall, so flour or oil hands and/or utensil before handling. 4. on a floured work surface, roll the dough out to 1/2 inch in thickness. 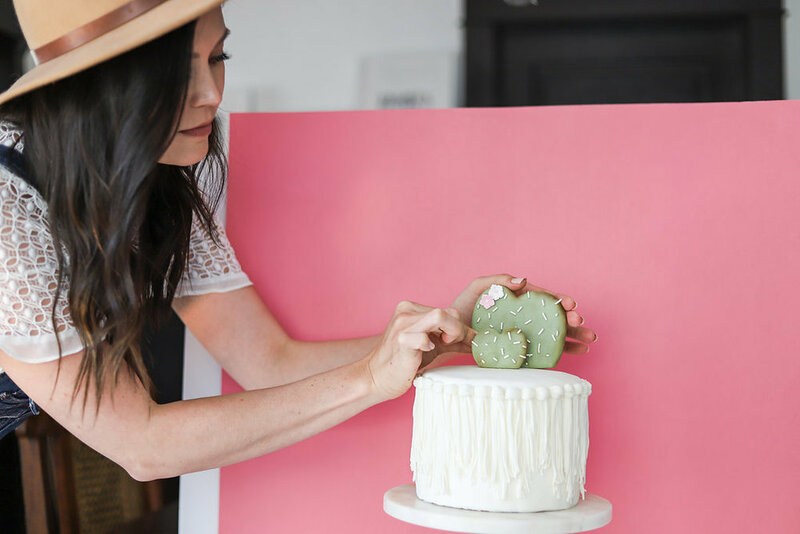 dip your donut cutter in flour each time, and press into the dough to make your shapes. place on a parchment lined baking sheet. (this can be a tedious process - to be gentle, and patient in handling these delicate puffs of perfection) let rest again for 30 mins - 1 hour. you will see them become more puffy. feel free to roll the left over holes and scraps into a ball and cut out more donuts - just remember to give them that last rest above before frying. 5. heat your oil to 375 d. fahrenheit to fry. by now, the donuts are even more delicate, so be careful not to misshapen them as they go into the oil. (if need be, cut the parchment around them and put in with parchment - it will peel right off when fried) cook in batches, I did two at a time. be sure to keep an eye on the temperature - if the oil is too hot, the outside will brown too quickly and the inside will be raw. cook about 30-45 seconds on each side. 6. place on a baking sheet lined with paper towels and a cooling rack on top to let absorb the residual oil and cool. 7. now to make the glaze: in a bowl, combine the powdered sugar, milk and vanilla extract and whisk until smooth. 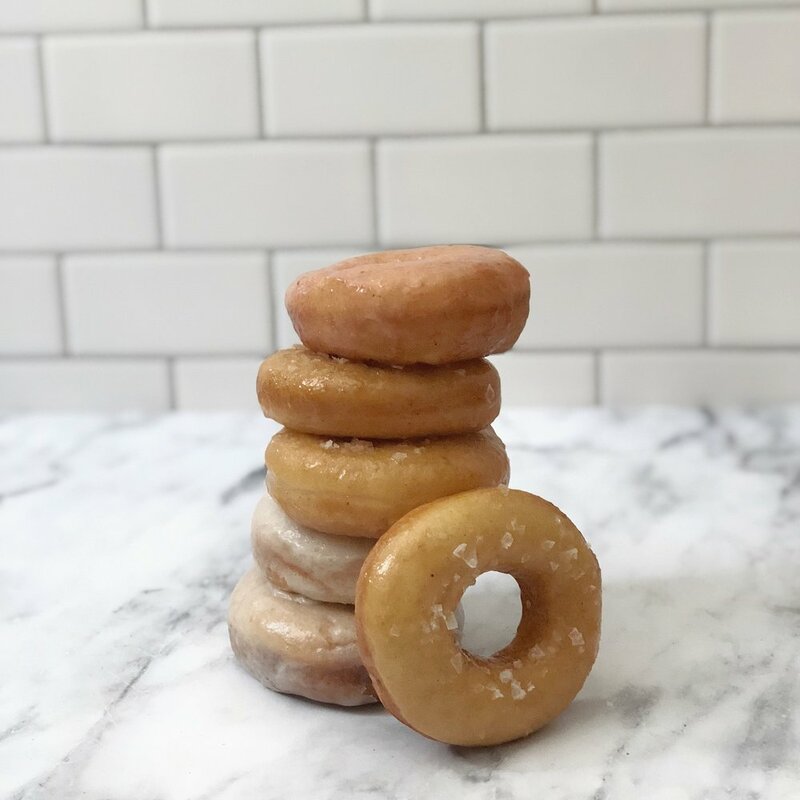 one donut at a time, dip each side of the donut and flip to the other side to ensure both sides are coated. place back on the cooling rack to drip and set. to make flavored glazes, replace 1/4 cup of milk with flavor of choice. for example, to make a strawberry glazed donut, you would use 1/2 cup of strawberry puree instead of milk. and as always, add milk by the teaspoon to achieve a thinner consistency. 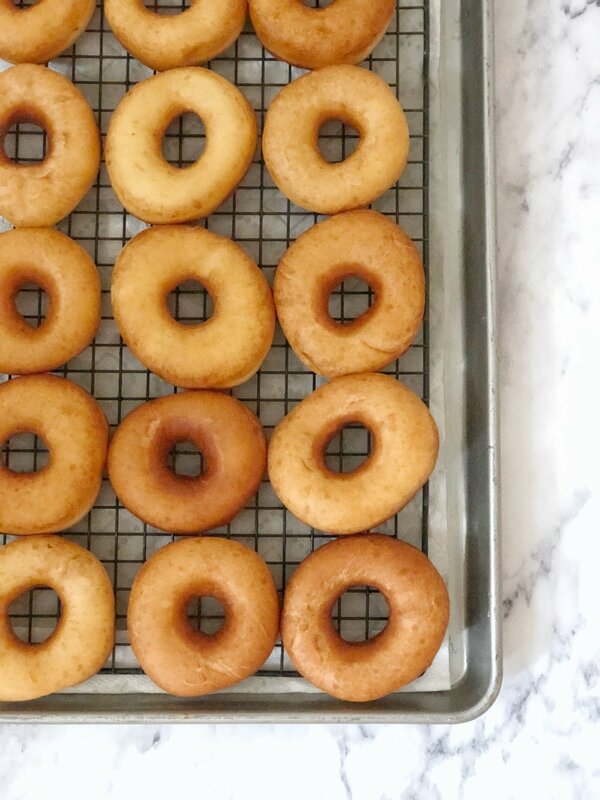 this recipe is a work in progress and i will always be striving to make my shipley's donut in my own kitchen. don't get me wrong - this one was amazing and delish, and i anticipate that this is a very long and loving relationship with this delight. i was so happy to have fresh donuts in my house from my own bare hands! makes each and every bite just that much more satisfying! this was definitely one of my more anticipated classes and i'm so excited to have finally made homemade fried donuts in my very own kitchen!